Can Technology Help Us to Care? Hi! My name is Amelia Abreu, and tonight I’m going to talk about the relationship between technology and care. Who am I and why am I talking to you about this? Well, in short, my work is centered around this relationship between humanity and technology. I work as a design researcher, and I’ve been in the tech industry for about ten years. I did graduate work in Human-Computer Interaction and worked as a researcher and instructor at University of Washington. For the past five years, I’ve been my daughter’s primary caretaker. This experience has been the most challenging and rewarding of my life, but it has also led me to refocus, and to think critically about care, who does it, and how we think about it. “What do you mean by Care?” you might ask. Well, I’ve looked at various definitions, and devised one for my purposes. I define care as “attending to expressed and anticipated needs”. I keep the recipient open ended, because I think that you can care for other people, you can care for yourself, you can care for pets, you can care for the environment, you can care for machines. Sometimes you’re caring for many of these things at once. 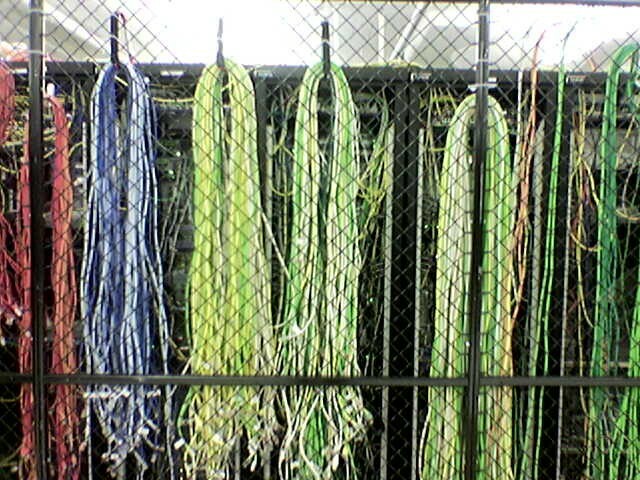 As an aside, shoutout to Sys Admins, who do quite a bit of care, both for people and machines. We tend to downplay care of machines as part of our work, but as this week’s Amazon Web Services outage shows, it’s crucial and vital work. Regardless, I want us all to recognize that Care is work, and I’m not interested in enforcing boundaries around where it takes place. But what does that work consist of? Care, I would argue, is highly skilled labor. Sociologists define three sorts of care: instrumental, emotional, and informational. Instrumental care is the sort that is the most visible, and in some respects, least valued. It’s the changing diapers, making food, cleaning offices. Emotional care is very similar to what the sociologist Arlie Hochschild termed “emotional labor” — listening, counseling, reassuring; remembering birthdays, saying good morning and good night. Informational care is the type of care that is by definition, technical. This is the application of best practices — cooking a meal for your friend with diabetes, adapting a building or an app so that people with different abilities can use it; making sure your children don’t have too much screen time. I make this point to introduce something that we often forget: that we as humans require more care than any other species. And this is a feature, not a bug! We require very intensive care in early life, and throughout our life, because we have such big brains. Interactions with our caregivers shape our cognitive, emotional, and intellectual capabilities, and there’s lots of fascinating research in neuroscience, cognitive science, and psychology exploring this. We, as humans, also require a great deal of care as adults, both in the day to day and in more intensive capacities- such as in the end of our lives or as the result of illness or disability. It’s estimated that 70 percent of adults will require long-term care at some point. What stands out though, at this moment in history, is how frequently that care will come from outside of traditional family structures. 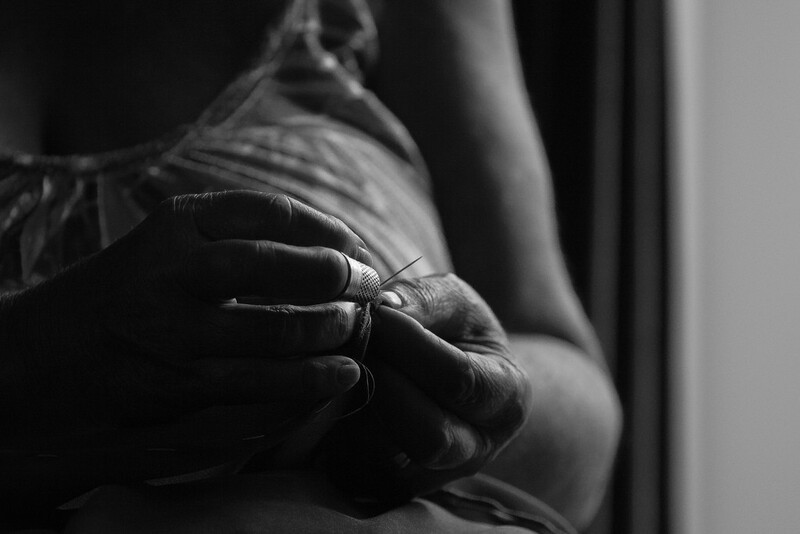 Economists project that caregiver will be the largest occupation in the US by the year 2020. I’ll talk more about the culture of tech in a minute, but I want to make this point first here: care is the cornerstone of our economy, and thus the largest market for technologies. 81 percent of jobs in the US are in the service sector, with those in fields that are particularly care-intensive: healthcare, hospitality, retail, and education making up over a third of all jobs total. And all of this is expected to grow. We are obsessed with growth in the tech industry, the 10x return. But the growth of the tech industry is pretty insignificant if you hold it in parallel to the growth of the care industry. Care also has a global supply chain, which raises even more questions for thinking about sustainability and worker conditions. Hochschild, whose term “Emotional Labor”, I referred to before, also popularized the term “global care chain”, referring to the global issues of how we divide the work of caring, who we hire to do it, and who comes from where to do it. In times like these, when immigration policy is in the news, it’s crucial to remember what work immigrants do: much of it is care. I fear that we haven’t thought about these issues at all, this reality of the world we live in, inside the world of the Tech Industry. If anything, we think of it as a problem to solve! Something we can hack! And I cannot emphasize enough how short-sighted this is. I worry that tech is facing a crisis of care. Perhaps the most obvious indicator of this is the way in which we work. We valorize long hours, and putting our work before care responsibilities. In certain tech companies, big and small, the phrase “Lockdown” means workers not leaving the office until a product ships. 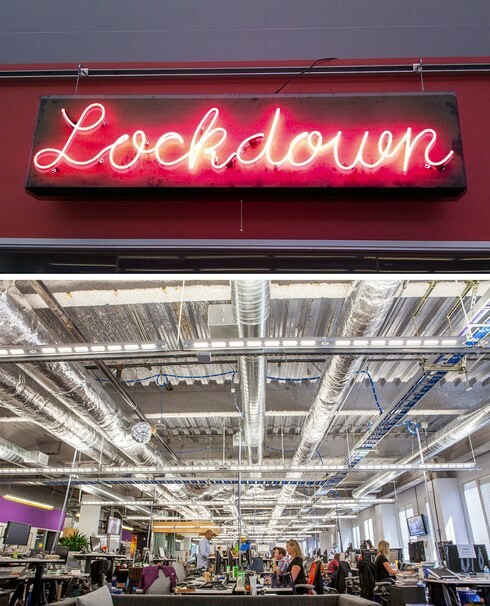 Facebook, for example, as embraced this as part of their culture, with neon signs for Lockdown like the one you see here. I don’t have to explain to you that working around the clock makes it fairly impossible to care for young kids or elderly parents, or even a pet, or yourself, really. What is the impact of this way of working, on not only who makes up our workforce, but the products we build? And what does it take, outside of that time building the product, to sustain our everyday lives, our families, our communities? There’s a price that we’re not fully calculating. For one thing, it’s hard not to see a pattern in venture-backed startups that promise to automate, or more realistically, obscure the work of care. From transportation to personal shopper services to courier services, to grocery shopper services, to chopping vegetables for dinner to putting together Ikea furniture, venture capital has funded, and we’ve built and designed a litany of apps for “just push a button” care services. As a designer, this is troublesome to me, to say the least. How much good does it do to design services that rely on underpaid contract laborers with fewer worker protections, and try and pass it off as “magic”? Of course, we also like to blur the lines of what humans do and machines do, relying on the care and attention of people — who are not acknowledged as tech workers — to do the things computers cannot do, and most likely will not be able to do with the sensitivity that is required. Adrian Chen’s reporting on Filipino contract workers who work as social media content moderators — truly a job that requires care- points out, among other factors, that there are over 100,000 contract workers in the Philippines, which is over 14 times the total employee headcount of Facebook. While Mark Zuckerberg continues to make grand announcements about making Facebook better, safer, and more thoughtful through artificial intelligence, he remains pretty silent about the industry that exists already to overcome the gaps in Facebook’s design and engineering. We’re working in ways that seem to require us to outsource care, then obscuring and devaluing care work. This is called innovation and disruption. Yet! When we are honest with ourselves, how much of care do we think we can automate? We cannot automate putting a scared child back to sleep after a nightmare, giving a friend a pep talk after a hard day, or hearing your older relatives’ stories. We cannot automate or service design building communities, which we do through everyday interaction. And we cannot build a better world by making work and life harder for the majority of workers. Is our diversity problem a care problem? It’s at this point that I want to draw our attention to whom exactly is doing the care work that we seem to want to streamline out of our lives. It is, to a very high degree, black and brown women, many of whom are the primary breadwinners- and caregivers — in their own families. This brings me to what I’ll call “The Paradox of the 36 year-old Latina Technologist” (that’s me). In such, Latinas make up less than 2 percent of the tech workforce, and at 10 years in the field, the industry boasts a 50% attrition rate for women. In terms of demographics, someone like me is statistically far more likely to be cleaning the building or serving food in the cafeteria of a tech company than working on a product team. And so it seems that the very same folks who are underrepresented in the ranks of tech’s leadership are overrepresented in work of caring for tech workers. Could better understanding care help solve tech’s diversity problem? At this point, I don’t think we can afford to not attempt it. So, as a design researcher, as someone who works with engineering teams to better understand their users, I want to propose that we do just this. We align with care, we learn from care workers. We recognize the care that makes our work possible, and we try to better understand what can make this work safer, more sustainable, and more highly recognized in our society. How disruptive could that be? What’s more, is I propose that we recognize the value of care in our own work- keeping our users safe, protecting their privacy, and doing so in a way that makes them feel cared for- this can be our goal. Let’s adopt an ethic of care for building technology, and make the next generation of technologies that will help us care.